MSI has launched a range of gaming notebooks sporting the NVIDIA GeForce GTX 10 series of graphic cards. 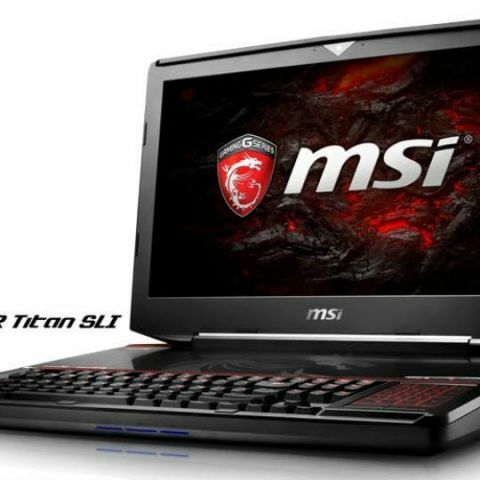 The MSI GT83VR 6RE Titan SLI is priced at RS. 3,37,900 and sports dual NVIDIA GeForce GTX 1070 graphic cards and 8GB GDDR memory. The GT72VR 6RE Dominator Pro Tobii with a single GTX 1070 is priced at Rs. 2,35,000. The GS63VR 6RF Stealth Pro and the Apache Pro come with a GTX 1060 graphics with 6GB GDDR5 memory. The two are priced at Rs. 1,77,900 and 1,49,900. MSI delivers whole level gaming notebooks from GT series, GS series and GE series comes with VR Ready by latest GEFORCE® GTX graphics, from GEFORCE® GTX 1080 SLI of GT83VR Titan SLI, GEFORCE® GTX 1070 of GT72VR,GEFORCE® GTX 1060 of GS63VR Stealth and GE62VR Apache Pro, that could fulfill most of the gamers’ demand in every segment. MSI always be the 1st one with top level GEFORCE® GTX SLI graphics in the market, and always have new ultra slim gaming notebooks with enthusiast GEFORCE® GTX graphics in the market every year. The GEFORCE® GTX 1080, GTX 1070 and GTX 1060 are same architecture, same CUDA cores and same performance as desktop graphics, that’s also why that NVIDIA removed the initial “M” in the back of the mobile platform GPU.Gamers and power users are looking forward to our latest gaming notebooks to have better gaming experience in each segment of the product, also comes with better cooling design, better 100% sRGB display and sound experience than other competitors. MSI GT83VR Titan SLI is the King of latest generation of the SLI platform design and both fulfill the highest VR Ready standards.The GT83VR Titan SLI has an enhanced Cherry MX mechanical keyboard with red-color backlighting and SteelSeries Engine 3 of Macro Keys setup. Supporting GEFORCE® GTX 1080 and 1070 SLI of dual graphics, it is ready the top power system for all VR gears on the market. Better yet, MSI Matrix Display technology supports Surround View Mode, 3x4K@60Hz output for 3 external displays, delivering an immersive, smooth and true-to-life surround gaming experience. For high level sound system, sound by Dynaudio speaker system and Nahimic 2 presents great sound experience, the finest headset AMP by ESS SABRE HiFi DAC presents 32bit/384kHz Hi-Res Audio quality which is 16x more sound detail than CD audio, which could make any of your high-end headset performance with its best experience ever. With Sound by Dynaudio, Nahimic 2 and Audio Boost 2, GT72VR series is embedded with a very good sound system. For a better vision experience, GT72VR Dominator is embedded with 120Hz/5ms fastest mobile display with 100% sRGB ready, or highest color range of 100% Adobe RGB ready of 4K IPS display that gives gamer or game designer different usage to take the lead in the gaming field in advance. Both packed with 1 M.2 SSD for NVMe or SATA storage combo design, and 1 more port for HDD. Weighing just 1.9kg, MSI GS63VR Stealth Pro is the COMPUTEX Best Choice Golden Award 2016 winner and the lightest 15“gaming laptop that packs a powerful cooling system and GEFORCE® GTX 1060 graphics, extreme computing performance and outstanding gaming features into a 17.7mm ultra slim chassis, which is even slimmer than some Ultrabooks, but much more powerful than many of the high spec notebooks. The Cooler Boost Trinity on GS63VR consists of 5 heatpipes and enhanced Whirlwind Blade fans for effective and silent heat dissipation. Moreover, independent design of dual thermal modules make sure that Core i7 6700HQ and GEFORCE® GTX 1060 graphics are well handled independently to ensure maximum gaming performance. With Steelseries keyboards and SteelSeries Engine 3, gamers could play games with their preset macro keys to win their games faster. ESS SABRE HiFi brings 24bit/192kHz Hi-Res Audio that makes gamers have greater sound experience. Not only for the high-end models in the market, MSI prepared GE62VR Apache Pro for the performance entertainment platform. As the higher value gaming notebooks position with GEFORCE® GTX 1060 graphics, GE62VR designed with the latest Cooler Boost 4 powerful thermal design, with dual fan and 6 heatpipes to keep them cool and quite when gaming, the SHIFT function from Dragon Center control panel could set high performance Core i7 CPU and GEFORCE® GTX 1060 graphics to keep at highest level of its performance boost range for gamers. MSI India will announce MSI FAN Day for the latest product line-up for gaming, VR and professional notebooks innovation this coming fall 2016 in New Delhi, Mumbai, Pune, Bangalore, Hyderabad, Chennai and Kolkata. Welcome and look forward to see you there.